The Sourcerist is back after an extended hiatus because The Sourcerist is on the move. Fingers crossed that any day now 1930s house Manchester will be replaced by 1930s house Suffolk. This house hunt commenced in May and we bought and sold straightaway, but the Dickensian UK house buying system means that nothing is legally binding until the last minute and the process has dragged on for months. So why am I telling you all this? Well between mentally letting go of the old house and trying not to fall in love too hard with the new house my blogging mojo left the building, but it’s back from holiday now. To make up for the lack of posts I’m going to show you a BEAUTIFUL thing. It combines many of my favourite things – it’s French, architectural, Art Deco, restored and saved from oblivion and it has a practical use! 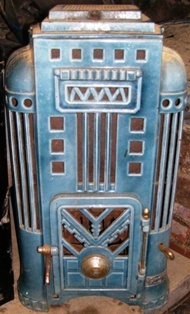 I present the Antinea Art Deco mutli-fuel stove by Caloria. Instead of having a gorgeous chrome statue of the Empire State Building (beautiful, but not useful) you can have it as a stove! Heating your house! Amazing. Needless to say we are saving up for one of these lovelies for our new home and I will be visiting the Antique French Stove Company soon. 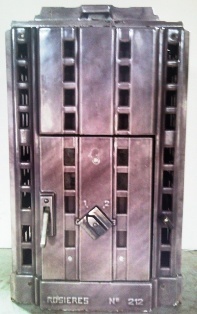 Last, but not least here is the Skyscraper by Rosieres for all the fans of Fritz Lang’s Metropolis out there. 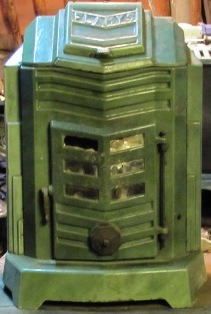 Art Deco buildings as multi-fuel stoves – genius. This entry was posted on September 3, 2014 by The Sourcerist in 1930s House, Inspiration, Sourcing and tagged Antique French Stoves, Briffault, Caloria, Fritz Lang, Rosieres.